← Moving to New York with pets. thank you friday: snowtober, fall, brooklyn bridge, Coco, phone calls with dad. Maybe this Thank You Friday thing will be bi-monthly thing? We’ll see. October is my favorite month ever (although November isn’t looking bad either). The cooler air starts wafting in and the colors start changing. People get festive and start decorating their lawns and doors and in New York I’ve learned that they go all out even in the tiniest of spaces. BUT this October was like a none other. My first birthday in New York was this year and we celebrated by taking a train out of the city. It was beyond anything I could have imagined. And to top it off, a totally random snow storm struck just when fall was settling in! Snowtober was great (recap tomorrow). But I am happy it’s over. 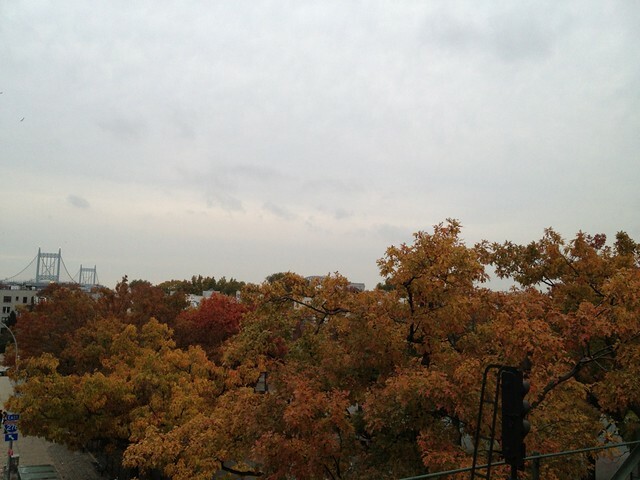 I am happy to see the brilliant fall colors. coco moca. 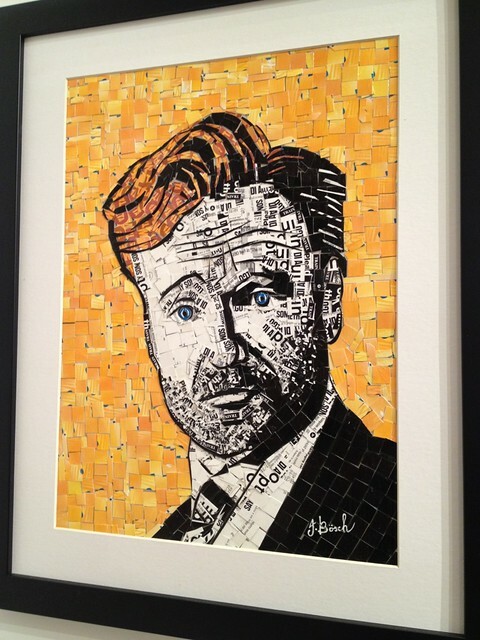 this portrait was made entirely out of metro cards. :) The art was actually pretty awesome, some pieces were sillier than other pieces but all very amazing. I am thankful for Coco. Not the warm beverage, I’m thankful for the man or the show or the persona. You get the idea. And specifically the Coco MoCA which was on display at the Shops at Columbus Circle, you know above Williams Sonoma, which lets just go ahead and say I’m thankful for them too. We wandered and ogled every piece of art on display and we sat in the amazing couch that talks, vibrates, and hugs. And we’ve been DVRing his NYC shows and watching them after work. The energy and creativity in the NYC shows has been awesome. So I guess I’m thankful for the silliness and the laughs Coco has brought into my week. Oh he’s also given me free t-shirts just for stopping by. I am super thankful for Trouble. He’s my cat as you’ll know if you read yesterday’s post full of awesome photos. He is 14 1/2 years old and he is the best. He is fierce and will scratch or bite if he’s upset and we aren’t heeding his tell tell warning signs, i.e. turned back ears, flicking his tail, scowling eyes, etc… (he has a lot of signs) but he is the best. Our friend Andrea (who I think is visiting this weekend?) walked him over in a large bowl from her house down the street 14 years ago and we picked him because he seemed like the calm one of the bunch. Through our ups and downs Trouble is always there to keep us company. I’m thankful for old friends, new friends, and comedy shows. 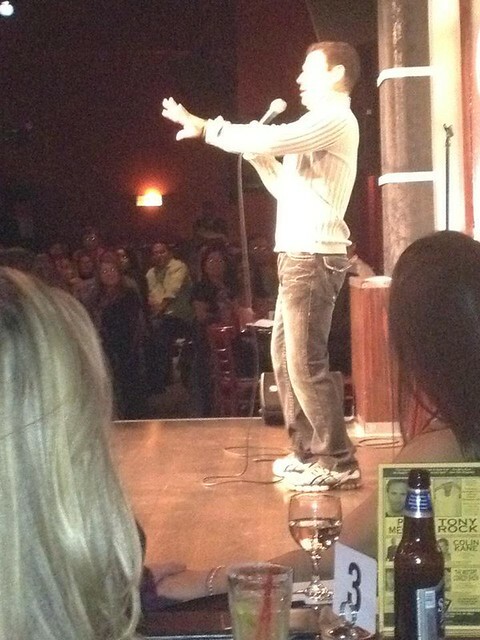 We saw Carlos Mencia perform at the Gotham City Comedy Club and it was like spending the evening with old friends. Juan V performed before Carlos. His jokes told in his soothing Latino/Texas accent were brilliant. 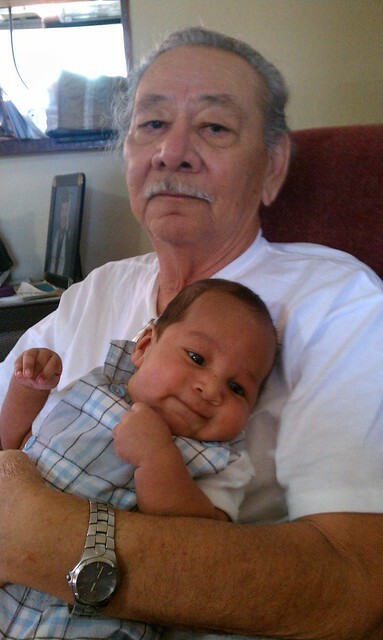 Blanca Gutierrez – I’m just saying. We saw an old friend from Texas there and he was friends w/Juan V so we got to chat with him and it turns out he is just as Latino/Texas as he seems. So perfect. Carlos was hilarious I nearly fell out of my chair when he told the jokes about his father. 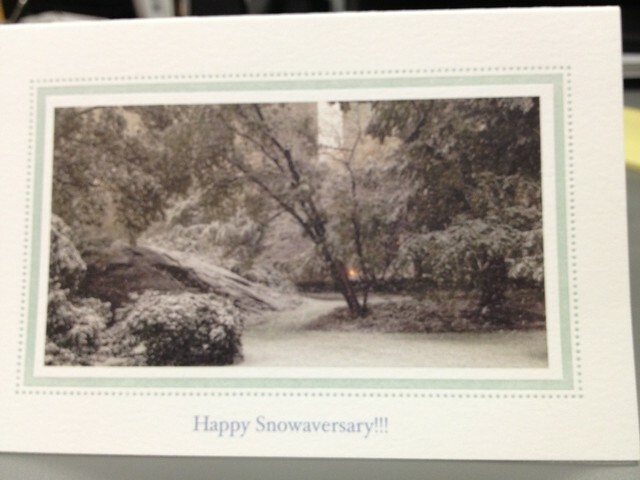 snowtober card from husband. he is awesome. I’m insanely thankful for phone calls with my Dad, especially post lung transplant due to Pulmonary Fibrosis. Dad has a cell phone that he rarely used in the past (in his healthy years), but he’s carried it with him religiously since the disease made him fear being alone (should he fall or his O2 stop working – no bueno). Anyway, he’s kept the habit now post transplant and I know he’ll actually answer when I call (as opposed to before the disease when he’d never have it on!). So I call. And it rings forever, ’cause at first he usually doesn’t recognize what sound that is from lack of use, hahaha. And we chat about football (I need to brush up for our next call) and I ask about his exercise and he asks about New York and it’s great. It is a luxury to have an extended conversation with my dad where he doesn’t have to stop mid-sentence to catch his breath and his words no longer sound like slurred gasps! This new lung has given him his voice back! 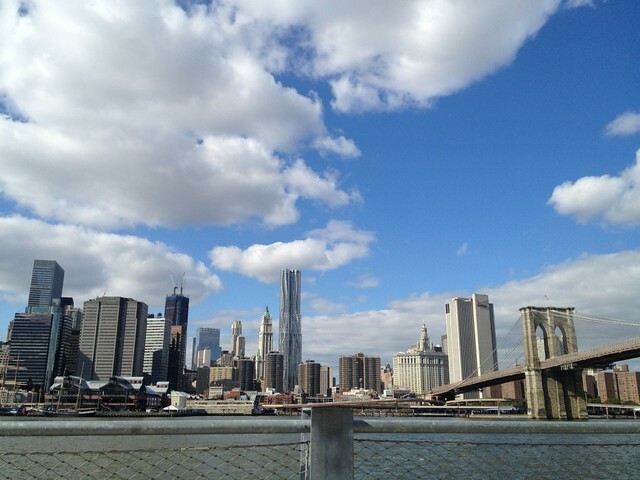 Oh and before I go, I’m thankful for clear days and the Brooklyn Bridge. We spent a recent Saturday or was it Sunday, we’ll just say it was a day in Brooklyn and part of it was at the Brooklyn Bridge Park. The view of Manhattan was amazing. view from the brooklyn bridge park. this photo is unaltered. i took it with my fancy iphone 4s and I am very impressed with it. If you are still with me, I’m thankful for bloggers. I’ve been reading a lot of race reports lately and this one about the Marine Core Marathon was amazing. I literally laughed out loud and cried and… just go read it and see what I mean. I also love reading Ali On the Run, sometimes I feel like she is in my head (you know, if I were an awesome dancer/runner/marathoner/writer/editor). Anyway, she’s my sometimes-blogger-best-friend (even though she has no clue about it – more on my many unbeknownst-BFFs later) and always has something awesomely ridiculous to say. I keep forgetting to post a photo of my new I heart Sweat shirt! next time, although I’m sure mine is in this blog’s photos somewhere! OK, more tomorrow. This entry was posted in everything i've blogged, thank you friday and tagged anniversary, Brooklyn, Brooklyn Bridge, Brooklyn Bridge Park, Carlos Mencia, Central Park, Columbus Circle, comedy, dad, manhattan, museum, New York City, Pulmonary Fibrosis, running, snow, subway, Texas, Williams Sonoma, Winter storm. Bookmark the permalink.